Android progress bar can be used for different purposes to show progressing status to the users like in downloading, playing music and video, uploading file and image, etc. In this tutorial, you will learn to create a circular ProgressBar in android application. To implement progress bar in android, we have to use android.widget.ProgressBar class. You can customize progress bar in android according to your requirement. Here I am going to show a simple circular progress bar and I am working with XML and little bit java code. Let’s start by creating new android project with the name Circular ProgressBar. Create a new XML file in res/drawable folder of your project and add following code. We link to this file later from XML layout file to create circular progress bar. Here I have added a ProgressBar with different attributes. Following is the complete content of XML layout file. Following is the complete code of java activity file. 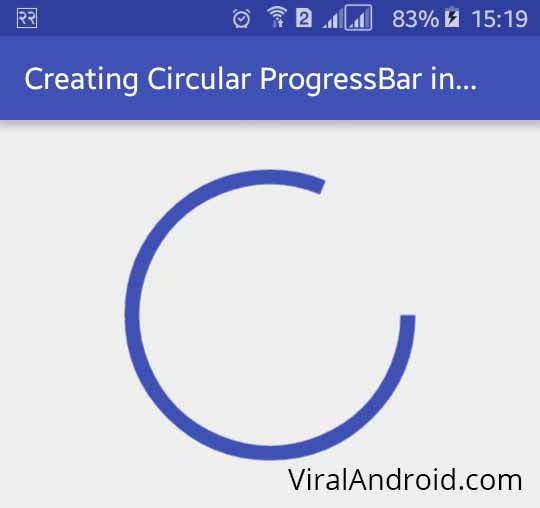 Now, run your Circular Android ProgressBar Example application, progress will start right after you start application like the above screenshot.